Denny Jump (Bellevue, WA, United States) on 4 December 2011 in Architecture. 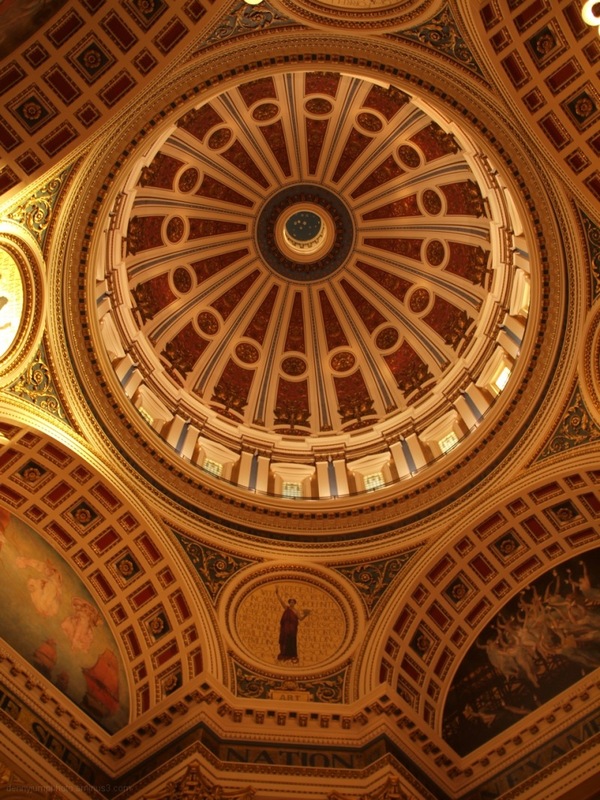 A view upward from the Rotunda of the Pennsylvania Stste Capital in Harrisburg, PA.
Wow, looks very grand place. Fabulous POV, superb Mr J! Powerful stuff these buildings . . I find I cannot help but be affected by being there. This is a wonderful shot, full of shape, good light levels, great colour, but the detail is stunning! Sorry, forgot to add, glad you didn't go for the symmetric centred composition. @Curly: Never care much for the symmetric centered stuff ;-) LOL Thanks very much Curly- Serioulsy I DO agree with you becasue those attempts often STILL wind up missing things...I just go for the neck breaking "straight up as best as you can but get some good stuff" shots ;-) Cheers and thankks, sincerely, kind sir! Glowing and ornately stunning; very well shot and a pleasure to view. Excellent share, Denny. Just beautifully shot and composed. Love it. This is beautiful. Amazing amount of work went into this. Great POV! These old dome interiors are magnificent ... give me these over ANY modern, all glass structure. I like how this has become almost an abstract photo, like looking through a kaleidoscope. A magnificent shot; such depth and rich detail....like something seen in Europe! Beautiful, Denny. Wow! Stunning capture with incredible detail! I love the contrast in colors which really makes the architectural detail stand out beautifully here. Beautiful shot looking up. Nice warm tones. A beautiful shot, Denny. I love these old public buildings with their elaborate decorations. superbe cadrage pour cette belle rotonde !